The Philadelphia Flyers announced that they have signed unrestricted free agent forwards Glen Metropolit (meh-troh-PAW-liht) and Nate Raduns; and unrestricted free agent defensemen Ossi Vaananen (AW-see VAN-ih-nehn) and Sean Curry, according to club General Manager Paul Holmgren. The 5’10”, 195-pound Metropolit signed a two-year contract, while the 6’3”, 205-pound Raduns signed a one-year contract. The 6’4”, 215-pound Vaananen signed a one-year contract, while the 6’4”, 230-pound Curry signed a two-year contract. Per club policy, financial terms were not disclosed. Metropolit, 34, recorded 11 goals and 22 assists for 33 points and 36 penalty minutes in 82 games for the Boston Bruins this past season. In 262 career NHL regular season games over six seasons with the Washington Capitals (1999-2000 through 2000-01 and 2001-02 through 2002-03), Tampa Bay Lightning (2001-02), Atlanta Thrashers (2006-07), St. Louis Blues (2006-07) and Boston (2007-08), Metropolit has registered 35 goals and 78 assists for 113 points and 96 penalty minutes. In his first season as a professional, Raduns, 24, registered 12 goals and 15 assists for 27 points and 42 penalty minutes in 56 regular season games for the Worcester Sharks of the American Hockey League this past season. 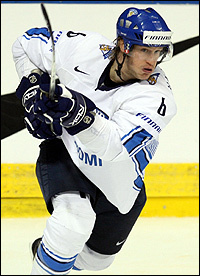 Prior to joining the professional ranks for the 2007-08 season, Raduns played four seasons for St. Cloud State of the Western Collegiate Hockey Association (2003-04 through 2006-07). He recorded 19 goals and 31 assists for 50 points and 175 penalty minutes in 143 games for St. Cloud State. Vaananen, 27, recorded seven goals and eight assists for 15 points and 102 penalty minutes in 45 games for Djurgardens IF Stockholm (Sweden) this past season. He was second on the team in penalty minutes with 102. In 430 career NHL regular season games over six seasons with the Phoenix Coyotes (2000-01 to 2003-04) and Colorado Avalanche (2003-04 through 2006-07), Vaananen has registered 12 goals and 45 assists for 57 points and 460 penalty minutes. He was originally drafted by Phoenix in the second round (43rd overall) of 1998 NHL Entry Draft. Curry, 26, registered 13 goals and 25 assists for 38 points and 139 penalty minutes in 72 regular season games for the Providence Bruins of the American Hockey League this past season. He was second on his team in penalty minutes (139) and led Bruins defensemen in goals (13). His 13 goals, 25 assists and 38 points were all new career highs for a single season. In six seasons as a professional, Curry has recorded 26 goals and 60 assists for 86 points and 713 penalty minutes in 410 regular season games with the Florida Everblades (ECHL - 2002-03), Lowell Lock Monsters (AHL - 2002-03 through 2004-05) and Providence (2005-06 through 2007-08). 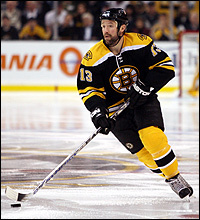 He was originally drafted by the Carolina Hurricanes in the seventh round (211th overall) of the 2001 NHL Entry Draft.